Smartphones are reaching the limits of innovation. Now they're being transformed by their cases. A popular gadget blogger proclaimed last week that "phone design has plateaued," that we have "reached peak smartphone" and that smartphones are pretty much as good as they're going to get. She has a point. And yet move forward we must. Smartphone users crave new features, and I believe that's why innovation is moving out of the smartphone and into smartphone cases. No, I'm not talking about mere customization, like Google's new $35 Live Case, which lets you customize your Nexus case with personal photos and gives you a "Shortcut button" that you can assign to any number of actions on the phone. I'm not talking about "weaponized" smartphone cases, like the idiotic case that looks like a gun or the IDEAL Conceal gun that looks like a smartphone case -- or even 247 Security's Volt case, which doubles as a 50,000-volt stun gun. I'm talking about innovation that extends the features and functionality of the smartphone itself and that transforms the smartphone into a super smartphone. Here are seven cases that reinvent the smartphone. Microsoft is working with researchers at the University of Applied Sciences Upper Austria to give smartphones a lot more real estate. They've put together a prototype that is almost as thin as paper. It covers the back and folds over the front. When open, the FlexCase can provide buttons and controls on its e-Ink display. In the video demo, the cover provides input controls when pressed, poked, swiped -- or even when the cover itself is bent. For example, you can zoom in or out of an on-screen map by bending the cover back or forward. Big, well-labeled buttons on the inside of the cover can control on-screen apps. The case even uses machine learning to intelligently interpret gestures used on the case. The FlexCase is still a research project and isn't expected to hit the market anytime soon. If the FlexCase is too extreme and far away in the future for you, E Ink Holdings has a more modest but still innovative offering. The company last week announced a 2.9-in. ePaper technology for smartphone cases, which enables smartphone apps to display content on the case itself with a very low-power approach. That content can be just about anything -- "maps, directions, bar codes, etc.," according to the company. The most innovative aspect of the E Ink technology is that the smartphone communicates with the case via Near Field Communication (NFC), which is normally used for contactless payments. The use of NFC means that the case can be "always on" -- always showing information -- yet needs no battery. It's not a product, but the foundation of a product for companies that may want to make their own version of it. A company called Vysk Communications makes a $229 smartphone case designed for top security -- just in time for the U.S. government crackdown on strong encryption. The Vysk QS1 smartphone case comes with its own embedded encryption processor and its own microphone. Dedicated camera shutters physically block both front and back cameras. The case also enables two privacy modes. The first mode, called Private Call Mode, requires a $12.95 monthly subscription above the purchase price. It enables private, encrypted VoIP calls to other Vysk subscribers. If you call a nonsubscriber, the Vysk QS1 generates an untraceable phone number on the fly. The subscription service also gives you secure messaging, voicemail, password protection, remote wipe and other security features. The second mode is called Lockdown Mode, which jams the phone's microphones and physically blocks the cameras. The Vysk QS1 shipped last year for the iPhone 5 and 5S and the Samsung Galaxy S4 and S5. Now Vysk says that it's planning to ship versions for the iPhone 6 and Galaxy S6 early in the fourth quarter of this year. The Speck Pocket VR case with CandyShell Grip gives you "military grade protection" and doubles as a virtual reality viewer. 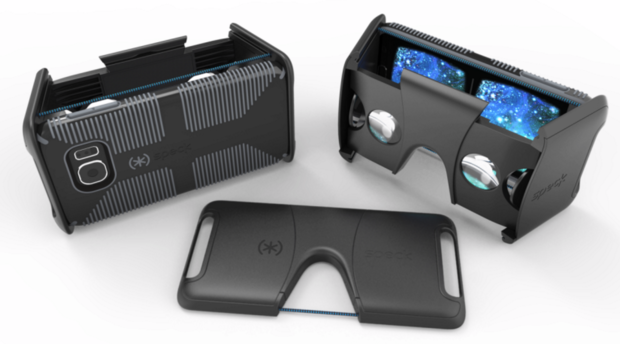 Case maker Speck is working on a $69.95 smartphone case that folds out into virtual reality goggles. The case is for the iPhone 6 and iPhone 6S. Speck claims that its case offers "military-grade protection" and folds out to give you a "rich viewing experience" for 3D concerts, virtual retail and augmented reality. The Speck Pocket VR case is expected to go on sale before summer. You can buy a smartphone that supports dual SIM cards. Or you can buy an iPhone. But you can't buy an iPhone with dual SIM card support. The $199 Krimston Two smartphone case is designed to add a second SIM card to your iPhone 6 or 6S. The advantage of dual SIM cards is that you can have separate work and personal phone numbers without carrying two phones -- or if you travel, you can have a "local" SIM card in two different countries. The Krimston Two case also enables your iPhone to function as an Internet hotspot, and gives you extra juice from the built-in battery pack. The Krimston Two is a Kickstarter-funded project. It's expected to ship in November. High-end smartphones like the iPhone have great cameras, but they lack some conveniences of a real digital SLR camera. The Pictar camera grip is designed to bring some DSLR benefits to the iPhone. By clipping the phone into the Pictar, you get a DSLR-like grip on one side, and five buttons for controlling the camera. As with a DSLR camera, a half-press on the shutter button locks the focus, and a full press takes the photo with that focus. A dedicated "zoom ring" on the back of the grip zooms in or out; pressing on the ring toggles between front and back cameras. An exposure compensation wheel lets you quickly dial through a selection of exposures. And a wild-card "smart wheel" can adjust whatever you want it to. You can use the Pictar app to choose what that wheel does. It also has a tripod connector on the bottom, while a cold-shoe connector on top can be used for a standard DSLR flash or a microphone. The Pictar works with iPhone models 4 through 6S, but not the "Plus" versions of the iPhone. It's expected to ship by the end of November. The wildest smartphone case concept I've ever heard comes from a U.K. company called Buzz Technology. The case comes with a tiny fold-up camera drone that lives in a slide-out drawer in the case, and that you can launch for aerial selfies (duck face not included). The drone itself is a tiny quadcopter and charges itself from the smartphone's battery. Once charged, it can fly more than 25 minutes at a time, according to Buzz. It's tethered to the phone while flying, and it's the tether that makes the long flying time possible: The battery is housed elsewhere in the case, and the juice is delivered through the tether. Buzz says it will come with a swappable-lens 8-to-12-megapixel camera. Because of the tether, it's helpful to think about the Drone-in-a-phone as a kind of flying selfie stick. It uses little propellers to get the camera farther away than your arm can reach. Buzz intends to launch a Kickstarter campaign in the third quarter of this year. There's no question that smartphones are nearing the limits of what's possible in a thin rectangle of technology -- at least for now. But through the supplemental use of cases, smartphone technology is crossing a new frontier.